Imagine a tube train that somehow finds its own way through tunnels. People may think it never happens but these ‘ghost’ tube trains do happen to be reality and whats more they carry a number passengers, no doubt quite terrified in some instances when their trains does strange things or travels through the tube tunnels without anybody in charge. This is a somewhat difficult subject as any available information is rather sketchy – and there are probably quite a few other incidents that have barely reached the public sphere. Sometimes its difficult to decide what a runaway train is. In terms of brevity I have applied it as being either one where no-one is in the cab and the train moves of its own free will – or if someone is in the cab, they are not in control of their train. Some of our tube lines have a constant falling gradient because of their north/south alignment from hills towards river and these include the Bakerloo and Northern, both notable for having the worst runaway incidents on the entire underground system. Train of 1962 stock about to enter the Queens Park sheds – 22 December 1987. The one recorded event on the Bakerloo very fortunately proved to be an incident nothing more. It had the makings of a huge calamity. Fortunately there was nothing else in the tunnels at the time nor the usual gang of people working in the tunnels, not even any fluffers (that is people who cleaned the tracks and tunnels, not what you might think!) The runaway train did however miss some track workers as it took leave from Queen’s Park station. It was February 1984. The train ‘escaped’ its ‘moorings’ at Queens Park and rolled through seven stations non stop before halting just after the eighth at Regent’s Park. The southbound platform at Baker Street which the runway train passed through. Something I have always wondered is was it 1938, 1959, 1962 or 1972 tube stock? 1972 stock did not appear on the line until 1985 so it must have been either 1938, 1959 or 1962 tube stock. In my own experience 1962 stock did not begin service on the Bakerloo until 1987 (as my photograph shows). It could have been a 1938 as these were the most numerous stock on the line. One LUL forum asserts it was 1959 stock. There were few of these on the line at the time so perhaps it was both inexperience of this stock plus oversight that led to the runaway incident. On the night in question all the line’s current was switched off and there were absolutely no train movements of any sort. Of the trains that had been stabled for the night, Queen’s Park’s platforms had two, and one of these, our runaway, was parked on platform two but had barely had any brakes on. Of the four braking systems the train had, only two had been employed and one was defective anyway. Thus the runaway was practically unbraked to all purposes. It was simply anchored to the track by means of a rail anchor. The nature of the line’s falling gradient was sufficient to break the rail anchor and allow the train to make its way southwards. This occurred on 19 February between 03.50 and 04.00am, so it must have taken more than two hours for the weight of the train to fracture the rail anchor. Its a device that clamps to the rails with a large hook which is inserted on the underneath of the train. This video of the Aldwych branch shows its train of 1973 tube stock being prepared for its day’s work and this includes removal of the track anchor. Screencap from the video mentioned showing the train/rail anchor clearly. Back to our Bakerloo train. It began to move off much to the chagrin of track staff doing maintenance at Queen’s Park. Apparently it missed four workers on the tracks by Queens Park south shed as it exited from the station. The train descended into the tunnels, and gathering speed it hurtled through eight stations (Kilburn Park, Maida Vale, Warwick Avenue, Paddington, Edgware Road, Marylebone, Baker Street and Regent’s Park) before eventually coming to a halt just short of Langham Place. If you do not know where that is, its about where the BBC’s Central London headquarters are. Regent’s Park station southbound – the runway stopped just a short distance beyond here. The night signalman on duty at Piccadilly Circus wasn’t even aware there was a train on the loose when asked if he knew where the runaway train was! Nothing had showed up on the track diagrams so clearly no one was any wiser as to where the train had gone. It was left to staff to venture through the tunnels until they found the missing train. They most definitely knew it would have gone quite a distance because much of the line from Queens Park to the Embankment is on a falling gradient. The first section out of Queen’s Park is the tunnel approach ramp and its considerably steep which gave the train a good start. That from Marylebone to Baker Street has a slight rise which possibly slowed the train enough for its ultimate stop beyond Regent’s Park. The section from Baker Street to Regents Park and on to Langham Place is very fortunately almost level and this – plus the sharp curve beneath Regent’s Park itself – proved sufficient to cancel the train’s momentum before it reached the descending gradient that follows Oxford Circus station. Its very fortunate the runway train did not opt for a full tour of the Bakerloo’s tunnels as far as the Elephant – or even Walworth Road! Very fortunately for all concerned, on that particular night, apart from those workers the train missed at Queen’s Park, there were no track maintenance gangs at work elsewhere on the line, no technical staff attending to signals in the tunnels, nor any fluffers cleaning the tracks, absolutely no cleaners working in the stations, or any staff on their ladders putting up posters on the opposite side of the tracks within the stations. A very calamitous accident had undoubtedly been avoided. Despite the fact no-one was hurt in any way or form, let it be said this incident was a very serious one. It shouldn’t have happened but it did and it seems it was down to sloppiness and both a lack of communication and safety procedures. Prior to the incident it was known the train had defective handbrakes. This had been reported by a driver two days earlier yet it seems maintenance staff overlooked it. The fact it was stabled at Queen’s Park station itself and not in the South Car sheds or Stonebridge Park/London Road depots awaiting attention is cause enough for concern. They had let a defective train roam the tracks a further two days and it was fortunate things happened the way they did. Procedures were consequently tightened up to prevent any further recurrences of this kind. Note: The runaway Northern Line rail grinder in 2010 travelled the furthest distance for a tube runaway with a total of 6.57km. The Bakerloo comes second in the ratings with its 5.7km however that distance is a surprise given the gradients are not quite as severe on the Bakerloo. The momentum attained on the latter is undoubtedly because the Queen’s Park ramp acted as the train’s launch pad! On 6 February 1968 a driver in charge of a District Line train failed to stop at some stations. The largest number of passengers affected were those intending to get off at East Ham. The driver was removed from duty and found to be drunk. He was hauled before East Ham court the next day and charged with driving a train while drunk. There’s very little other information on this. Its clear that despite the District Line’s driver being present on the train, the fact he wasn’t in control of his train does describe it as a runaway, especially as he didnt stop at some of the stations. Not a tube train but still a runaway incident on the tube system. This invovled a runaway trolley during the hours the tube was closed and works were being undertaken on the line, the purpose of which was to fettle the ballast and re ballast where necessary to maintain optimal rail integrity and prevent wet beds developing. Due to the limited clearances this task must still be done manually and this explains the rather large contingent of manpower in attendance including workers on the tracks. Techically the task is known as wet bed rectification works. The incident occurred on 24 May 2000. It is said the trolley was being moved by operatives and laden with 40 bags of fresh ballast. The trolley was being moved along the platform at Notting Hill Gate and southwards towards the work sites. It began to move faster than the operatives could reasonably walk. They tried to apply the brakes to stop the trolley’s momentum but their efforts were ineffective. They tried to keep up with it and halt its progress but that was to no avail as its being laden with 40 bags of ballast meant it was far too heavy to be stopped simply. High Street Kensington – which would have been the southernmost extremity of the works undertaken in May 2000. The trolley’s operatives shouted a warning down the tunnels and the track inspectors heard this and repeated the warnings onwards so the track gangs at work further towards High Street Kensington were somewhat forewarned of an impeding incident. The trolley hurtled along the downhill gradient from Notting Hill Gate towards High Street Kensington, colliding with a stationary trolley being used by the track gangs themselves at a location just north of High St Kensington station. The force of the collision propelled both runaway and stationary trolley a further 15-20 metres before they stopped. The maintenance workers at this point had by then been very fortunately able to jump clear of the track. The vehicle was a Rotamag split trolley, a type in common use on the tube and rail networks. It is said the trolley’s brakes had been modified (a common practice on other railways apparently with this type of trolley) and this mod in fact reduce the brakes’ effectiveness. Failures to inspect the trolley prior to its use on the tracks also apparently contributed to the incident. Had this been properly done the trolley should have not been allowed into use. The contractors (termed as Infracos in legal parlance – they were being employed under the tube’s failed PPP arrangement of the time) who had been in charge of these trolleys were not given vital information about the nature of the Circle/District lines in the area such as the somewhat severe gradients. The gradient falls at 1 in 70 towards High Street Kensington and this information should have been made available by TfL’s engineers. The accident report concluded this alone would have ensured the trolley’s supervisors were more critical about securing and keeping the trolley in position. Besides these two events, little else is known about potential runway trains on the Circle/District/Hammersmith Lines. However there was a runaway Circle Line train at Aldgate in 2005. It was mentioned on page 66 of the Annual Report on Railway Safety 2005. As it turns out the train in question had been targeted during the terrorist incidents of July 2005. Problems occurred in trying to retrieve the damaged train and at one stage the train rolled back through the points at the junction just outside Aldgate station and into the tunnels towards Whitechapel. It was an incident cause enough to warrant the presence of the Rail Safety inspectors. However I think the difficult nature of the job plus a considerably damaged train mitigated the fact it had run backwards in to the tunnels towards Aldgate East and been stopped about three carriage lengths into the tunnels therein. Even the Jubilee has had a runway of sorts. It was a very brief episode however the nature caused enough concern that operating procedures on the Jubilee had to be changed. The train operator wasn’t in control of the train as the event occurred. This involved a train stopping at the staff platform by Stratford Market depot. The time allowed for this was just five seconds and by the time the operator had opened his door to let a member of staff on, at that very moment the train started moving off because it registered that the five second limit had expired. It fortunately detected there was a problem with the cab door and stopped again in a very short distance. The small halt by Abbey Road bridge West Ham, giving staff access to Stratford Market depot. Source: You Tube. A result of this Jubilee Line operators now have the option to put the train in manual and ensure the stop is sufficiently long enough to allow staff to get on or off the train en route to or from Stratford Market depot. More here – BBC: Automatic Tube train sets off with driver door open. On 30 July, 1946, a driver applying the brakes on a train approaching Edgware station on the Northern line suffered from a coronary thrombosis, leading him to release the brakes shortly afterwards under the semi-conscious impression that he had reached the station. However, the train had not stopped, but was instead travelling at at least 12mph, leading it to continue through the sand drag, over the buffers and into a wall at the terminus. The driver died due to his illness while stuck inside the carriage, but nobody else was seriously hurt. Ministry of Transport report on the Edgware incident 1946. Besides the 1946 incident there have been three others of quite a serious nature and all occurred in the last two decades. On 8 July 2000. The driver of a north bound train fell alseep at the controls once it had arrived at Belsize Park. He slumped upon the deadman’s control which effectively prevented it from being braked against any movement. The train then began to roll back downhill to Chalk Farm and was only stopped by a trip which fortunately activated the train’s brakes. It was the weekend and the passengers were very lucky there was no other train at the time on its way up to Belsize Park other wise it could easily have been an accident of Moorgate proportions. London Underground launched an investigation and the driver, who has 20 years’ experience, was questioned. A breath test proved negative and managers are awaiting the result of a drug test. After the Belsize Park incident a new form of Run Back Protection was applied to tube trains. It had been used on Victoria Line trains from the start, but a new design was needed for tube trains that were driven. The system, known as RPS, was begun in 2001 and implemented on all lines bar the Victoria. The train fortunately arrived safely at Challk Farm station without any dire consequences. The dead man’s handle is the safety lever in the train’s control cab which must be held in the ‘on’ position under spring-loaded pressure by the driver. If it is released, the brakes lock automatically to stop the train should the driver collapse or be taken ill. However, the runaway Northern line train – revealed on Monday by the Evening Standard – exposed a serious weakness in the design. When the driver apparently fell asleep, despite the dead man’s handle his train was able to career backwards out of control for half a mile. This potentially dangerous incident showed that if an unconscious driver slumps forward against the handle it could remain in such a position which prevents the brakes from being applied. Another very serious runway invovled the Northern Line once again. It was Friday 13th August 2010. 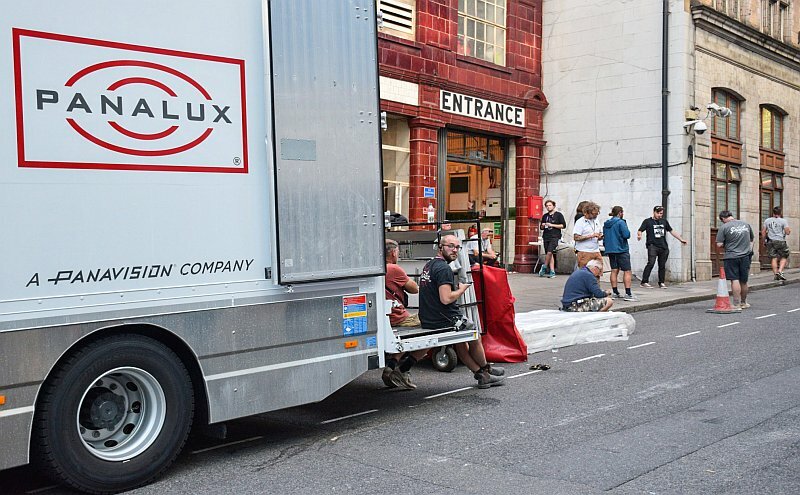 A failed rail grinding unit broke free from its couplings and sped from Highgate tube station to near Warren Street, a distance of four miles as the BBC reports. The driver of a tube train at Archway was told to take his train as fast as he could out of the area and he sped his train through quite a number of stations, not stopping until he reached Moorgate as per the instructions of his line controllers. Headlines that made it very specific this was a ‘Friday the 13th’ incident! As the Metro recounts, the tube train was ‘chased’ by the runaway works train. In my view had he gone as far as Angel it would have been okay because the line climbs quite steeply upwards from Kings Cross anyway. Archway’s southbound platform which saw a fair bit of drama in August 2010. The offending works train in the meantime was switched to the Charing Cross branch where it came to a stop just before Warren Street station. A leaked video apparently shows the LUL control room console at Coburg Street with the runaway rail grinder and the tube train in front trying to get away from it. TfL/London Underground did not want to comment on this. This has been a well documented episode which is why I have instead given a summary. The links given will provide more information as well as the detailed inspectors report. You Tube has a number of reports showing the rail grinder running away through the various stations. London Underground and contractors fined for 2010 runaway incident. Rail Accident Investigation report on 2010 incident. In March 2014 the Northern Line was again in the news with regards to runaway trains. This time even though the line was now fully automated and 100% safe, a train of 1995 stock decided to take a non-stop journey through a number of stations. Its train operator was unable to intervene and stop the train’s progress – and he had no choice but to apologise to the extremely concerned passengers he had no control over the train. The train passed four stations between Old Street and the Elephant & Castle. Moorgate, Bank, London Bridge, Borough. The passengers had just detrained from a faulty train at Old Street. They caught the following service and it was this that didnt stop. London Underground’s explanation was the defective train had been instructed not to stop at stations and somehow this also translated to the following passenger train. Pat Hansbury, general manager of the Northern line, London Underground, said: ‘I apologise to customers who were inconvenienced when they were unable to alight at their usual stops for a short time on a southbound Northern line train this afternoon. This is the Elephant. All change here for trains back to Borough, London Bridge, Bank and Moorgate! He said: ’The safety system built into the signalling controls meant that the train was at all times kept at a controlled distance from the train ahead – pausing when the train in front stopped at each station then proceeding when it was safe to do so, this is a key feature of the signalling system. The train travelled at a controlled speed throughout the journey without any risk to passengers safety at all times, however we are investigating why the instruction remained in place for the replacement train’. The Piccadilly Line had a runaway tube train in 1993 from King’s Cross to Holloway Road. Up to 150 passengers were aboard the 8.50am from King’s Cross to Cockfosters. It sped through the tunnels at up to forty miles per hour. Fortunately it got stopped by the emergency brake tripping system as it passed a red light just before Holloway Road station. On 2nd December 1993, the train in question was stopped at King’s Cross tube station whilst there was a problem occurred with one of the doors. Subhash Ramanuj left his driver’s cab to investigate the issue but before doing that he hung his bag, consisting of sandwiches and a football kit, upon the deadman’s handle. He went to the problematic train doors and fixed them. As he returned along the platform to his cab, the train suddenly moved off northwards, totally driverless. Here’s a report on the incident – Independent 3 December 1993. As this article explains this is what happened afterwards…. The train has been taken to the depot at Cockfosters, north London, to be examined. The driver was interviewed and breathalysed, as a matter of course. It was later announced that the test proved negative. In the meantime as the event itself unfolded, waiting passengers at Caledonian Road station must have been very surprised to see a driverless tube train complete with passengers hurtling past…. Back at King’s Cross Ramanuji radioed and told line control his train had been hijacked. It hadn’t of course. However in the event there was no time to check whether this was true or not. Passengers were detrained from the following service at King’s Cross. This second train was commandeered by both tube staff and British Transport Police and it set off in pursuit of the runaway train. Holloway Road station, where the passengers of the runway train were able to get off and the episode safely concluded. As has been mentioned the runaway was halted by signals just before Holloway Road, and the other train drew up to it. Police and staff reassured passengers and entered the train cab to find the driver’s bag draped over the deadman’s handle. It was absolutely clear to them hijack wasn’t even any sort of factor and the driver’s game was clearly up. The tube staff took the runaway train into Holloway tube station where its passengers were able to get off. At Snaresbrook Crown Court in October 1994 Ramanuji was sentenced to six months in prison for wilfully endangering the safety of his passengers. Independent 29 October 1994 headline re runaway Piccadilly tube incident. Mention must be made of another ‘runaway’ train on the Piccadilly Line during 1985. Although it wasn’t exactly a runaway because it had a driver in charge, it had the unusual distinction of being fully laden with passengers and venturing down a new yet unopened tube line! In that respect it had run off its normal route! On 20 November 1985 a Piccadilly Line train for Heathrow Central was erroneously sent down the unopened loop via Terminal Four. The new line was not opened until 12 April 1986 by Prince Charles and Princess Diana, yet this unofficial ‘preview’ train had the distinction of being the very first passenger train down the new loop. Naturally it couldn’t stop at the unfinished Terminal Four station so continued onwards to Heathrow Central. Hatton Cross station – where a Piccadilly train was inadvertently sent via the Terminal Four loop. The final incident to be mentioned in regards to the Piccadilly Line occurred in early 1976. Its not exactly a fully fledged runaway train of course but its driver failed to stop at some stations whilst at others he stopped his train partially in the tunnels. Our guy’s journey from Cockfosters towards Earl’s Court. He must have passed through many of these stops, wittingly – or unwittingly – whilst drunk. The driver in question was Walken Joseph Jeffers of Islington who had been trusted with the task of taking a Piccadilly Line service from Cockfosters to Rayners Lane. The only problem was Jeffers was totally drunk and barely in control of any sort of tube train. Jeffers’ train guard became concerned at his driver’s erratic technique so he alerted the line controllers en route. Several line managers were dispatched urgently to await the train at Arsenal. When it arrived they ensured the passengers were detrained before driving it out of service with Jeffers still in the cab. The train was taken as far as Earl’s Court where police were waiting to arrest the drunk driver. Jeffers refused to permit a blood test to be taken at Earl’s Court police station. However he was seen by a doctor who said without a doubt the tube driver was certainly unfit to be in charge of a train. Earl’s Court – where our drunk driver’s trip ended right in the hands of the police. The drunk tube driver was hauled before West London magistrates court on 4th March 1976 and pleaded guilty to being drunk in charge of a train. He explained he had not slept for two days and had problems regarding his wife. He was sentenced to two months imprisonment. 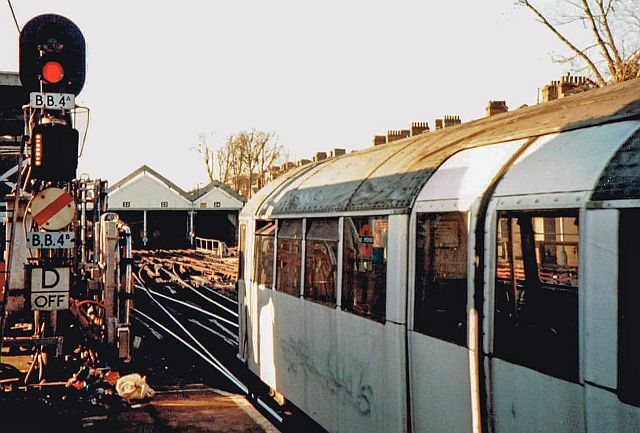 This post continues in Part Two with a look at runaway trains on the Victoria Line, Waterloo & City, Island Line – and more. Previous Post: Jubilee Line goes full throttle! Next Post: Woolwich Ferry does The Scream….